Oh, she looks so sad. This is beautiful though. Wonderful illustration, i love the way the background is painted,and the concept. I love your idea, great work! Wonderful! I love this piece. Beautiful piece! I love your way of using colours!! 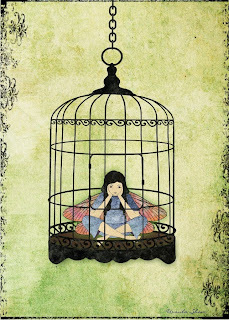 like the background texture and colors and the use of line on her wings and cage.